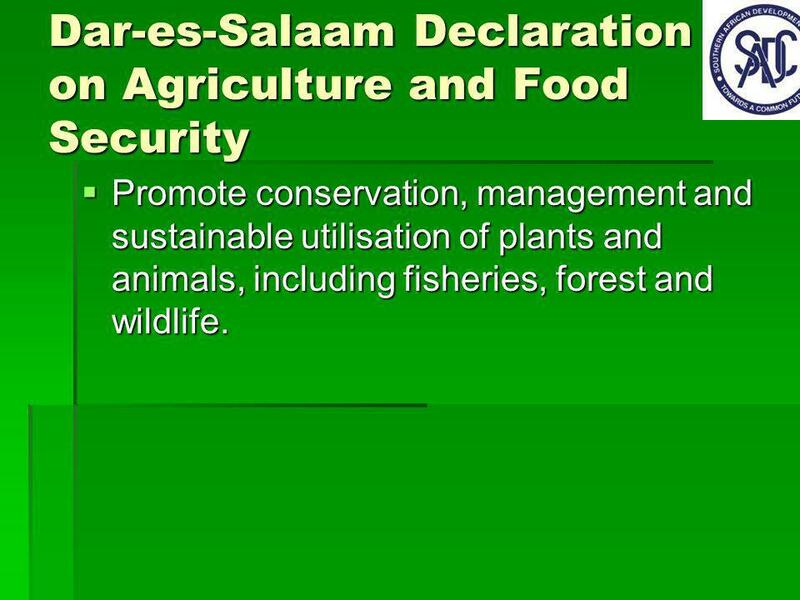 6 Dar-es-Salaam Declaration on Agriculture and Food Security Promote conservation, management and sustainable utilisation of plants and animals, including fisheries, forest and wildlife. Promote conservation, management and sustainable utilisation of plants and animals, including fisheries, forest and wildlife. 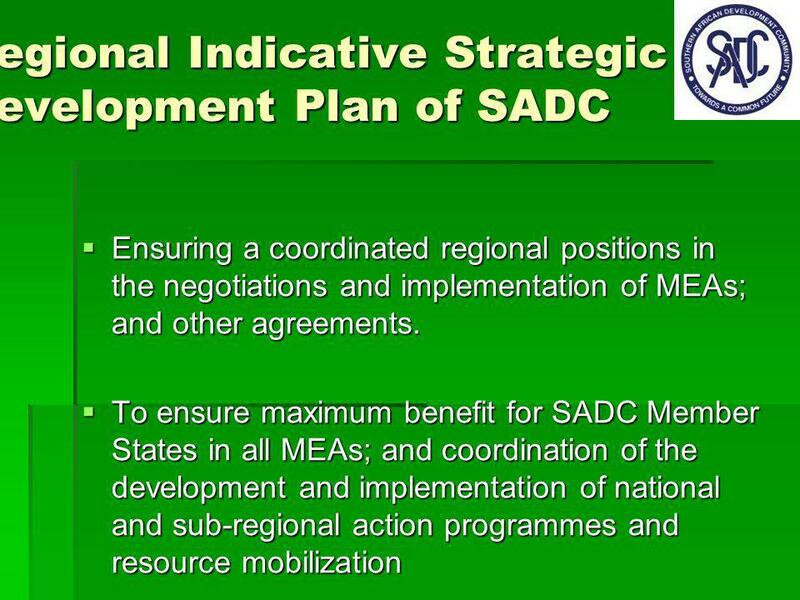 8 SADC Policy Decisions SADC Extra-Ordinary Summit on Poverty and Development, held in Mauritius in April 2008 recognised the urgent need for the region to address climate change, particularly adaptation in order to safe guard livelihoods. 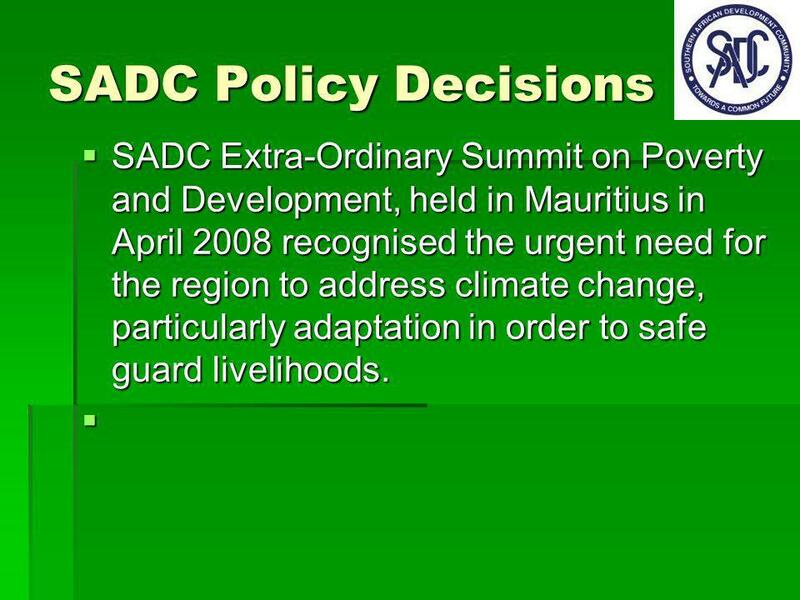 SADC Extra-Ordinary Summit on Poverty and Development, held in Mauritius in April 2008 recognised the urgent need for the region to address climate change, particularly adaptation in order to safe guard livelihoods. 9 Setting the Scene Established a Task Force to spearhead development of a programme on climate change; Established a Task Force to spearhead development of a programme on climate change; Identified the need to assess the impacts of carbon trading on the region & mobilised resources; Identified the need to assess the impacts of carbon trading on the region & mobilised resources; Joined forces with COMESA and EAC in developing a programme on Bio-carbon. Joined forces with COMESA and EAC in developing a programme on Bio-carbon. Identified need for training negotiators and mobilised support. Identified need for training negotiators and mobilised support. 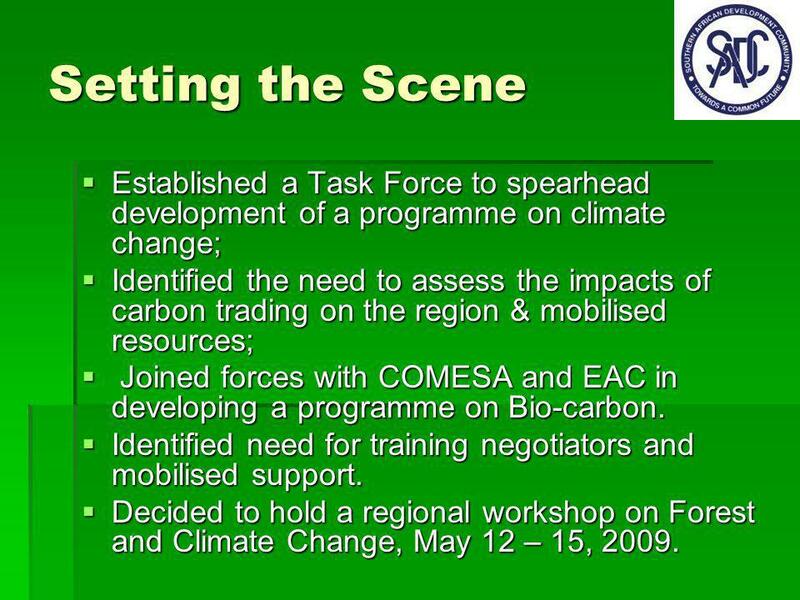 Decided to hold a regional workshop on Forest and Climate Change, May 12 – 15, 2009. 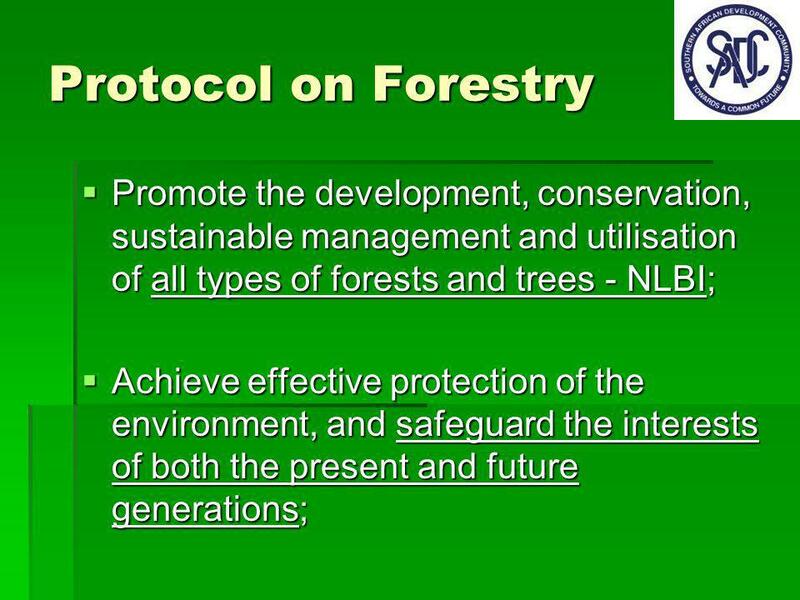 Decided to hold a regional workshop on Forest and Climate Change, May 12 – 15, 2009. 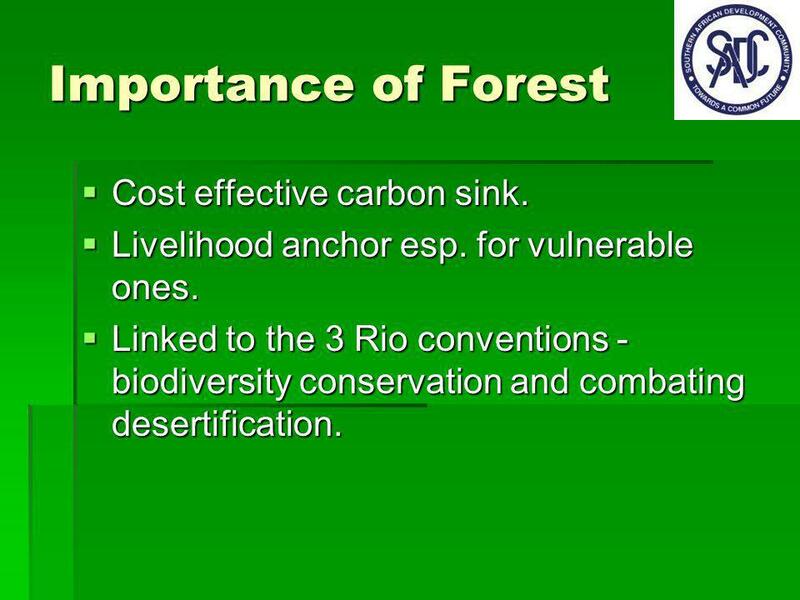 11 Importance of Forest Cost effective carbon sink. Cost effective carbon sink. Livelihood anchor esp. for vulnerable ones. Livelihood anchor esp. for vulnerable ones. Linked to the 3 Rio conventions - biodiversity conservation and combating desertification. Linked to the 3 Rio conventions - biodiversity conservation and combating desertification. 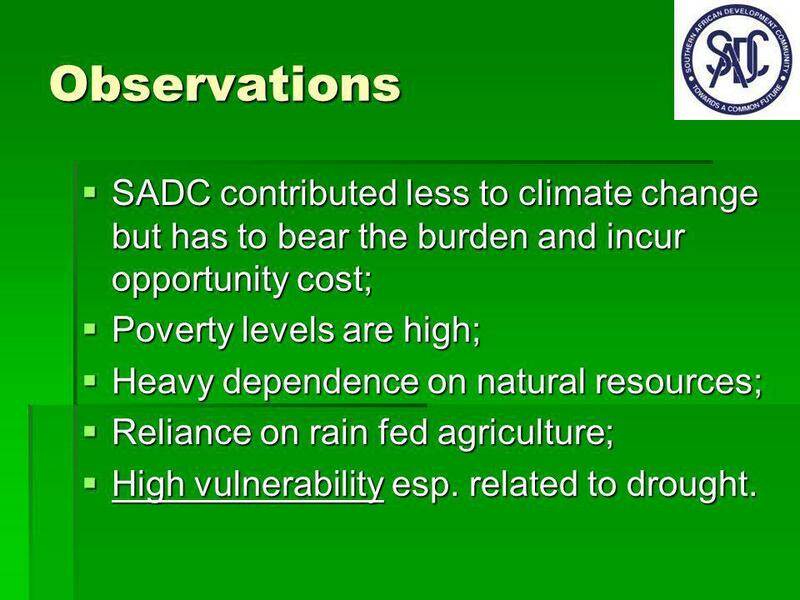 12 Observations SADC contributed less to climate change but has to bear the burden and incur opportunity cost; SADC contributed less to climate change but has to bear the burden and incur opportunity cost; Poverty levels are high; Poverty levels are high; Heavy dependence on natural resources; Heavy dependence on natural resources; Reliance on rain fed agriculture; Reliance on rain fed agriculture; High vulnerability esp. related to drought. High vulnerability esp. related to drought. 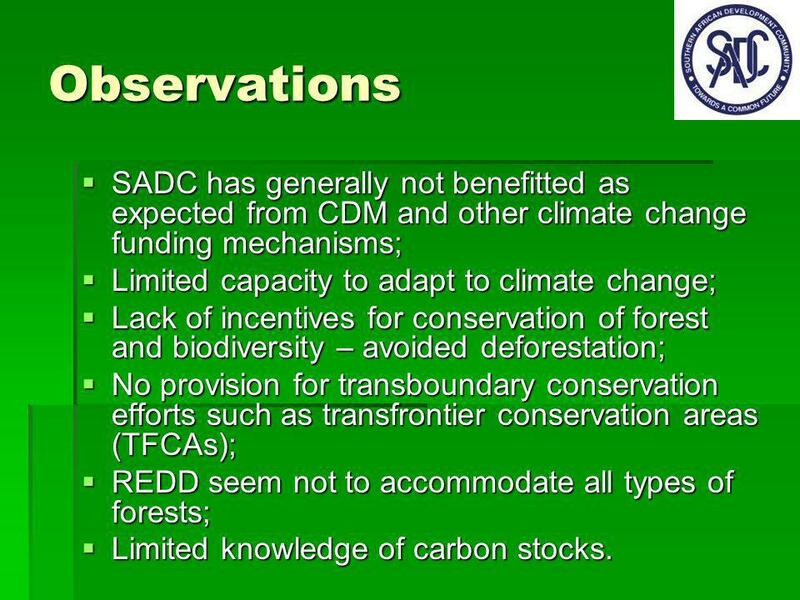 13 Observations SADC has generally not benefitted as expected from CDM and other climate change funding mechanisms; SADC has generally not benefitted as expected from CDM and other climate change funding mechanisms; Limited capacity to adapt to climate change; Limited capacity to adapt to climate change; Lack of incentives for conservation of forest and biodiversity – avoided deforestation; Lack of incentives for conservation of forest and biodiversity – avoided deforestation; No provision for transboundary conservation efforts such as transfrontier conservation areas (TFCAs); No provision for transboundary conservation efforts such as transfrontier conservation areas (TFCAs); REDD seem not to accommodate all types of forests; REDD seem not to accommodate all types of forests; Limited knowledge of carbon stocks. Limited knowledge of carbon stocks. 14 Concern Carbon markets if not handled well may not address climate change. Carbon markets if not handled well may not address climate change. Absence of incentives for conservation will not result in increased emissions from reduce emissions from deforestation and forest degradation. Absence of incentives for conservation will not result in increased emissions from reduce emissions from deforestation and forest degradation. Without recognition of sequestration of carbon by soils in SADC, will not provide sufficient incentives for low forest countries not to disturb the land. 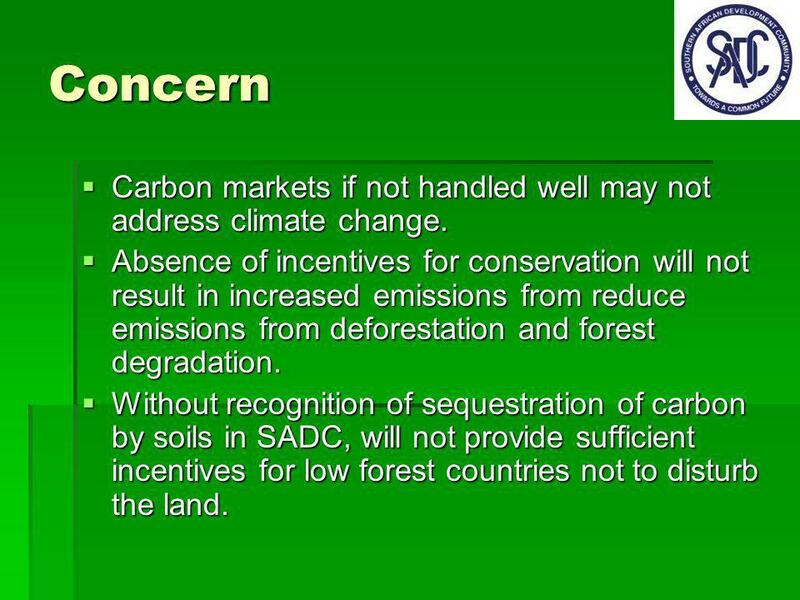 Without recognition of sequestration of carbon by soils in SADC, will not provide sufficient incentives for low forest countries not to disturb the land. 15 Consideration Committed to adopt technologies and systems that reduce all kinds of emissions – despite low contribution; Committed to adopt technologies and systems that reduce all kinds of emissions – despite low contribution; The priority REDD should not just be for reducing emissions but as an opportunity to enhance national development – conservation of biodiversity; The priority REDD should not just be for reducing emissions but as an opportunity to enhance national development – conservation of biodiversity; Predictable, sustainable and additional financial commitments from Annex I countries – condition; Predictable, sustainable and additional financial commitments from Annex I countries – condition; The concerns and priorities of local communities and forest dependent communities must be taken into consideration in REDD. The concerns and priorities of local communities and forest dependent communities must be taken into consideration in REDD. 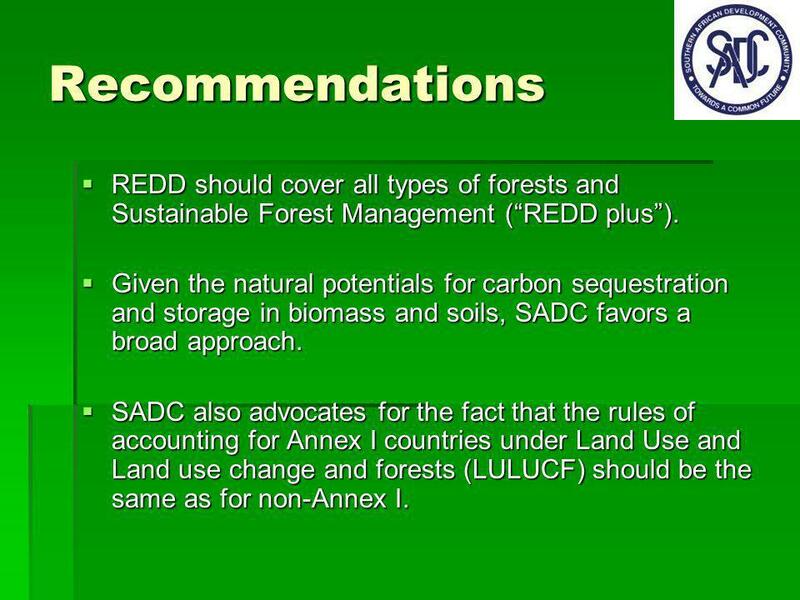 16 Recommendations REDD should cover all types of forests and Sustainable Forest Management (REDD plus). REDD should cover all types of forests and Sustainable Forest Management (REDD plus). Given the natural potentials for carbon sequestration and storage in biomass and soils, SADC favors a broad approach. Given the natural potentials for carbon sequestration and storage in biomass and soils, SADC favors a broad approach. 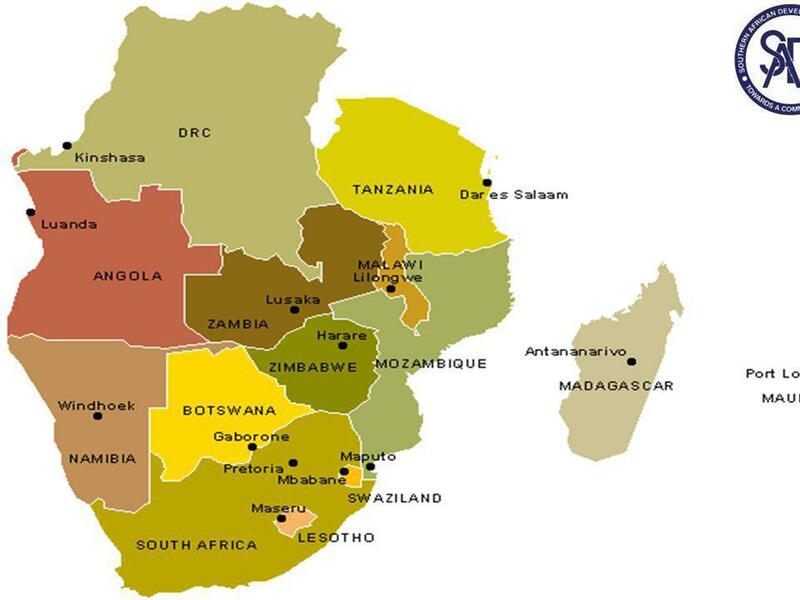 SADC also advocates for the fact that the rules of accounting for Annex I countries under Land Use and Land use change and forests (LULUCF) should be the same as for non-Annex I. SADC also advocates for the fact that the rules of accounting for Annex I countries under Land Use and Land use change and forests (LULUCF) should be the same as for non-Annex I. 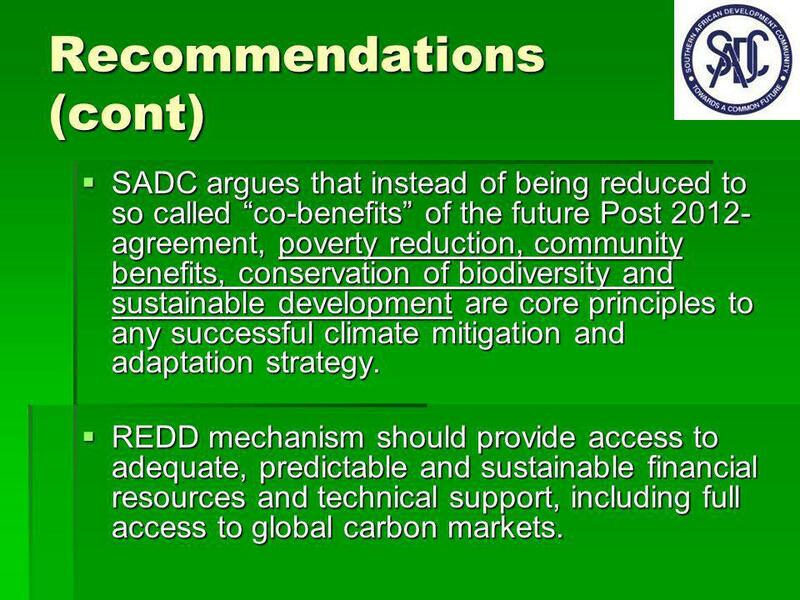 17 Recommendations (cont) SADC argues that instead of being reduced to so called co-benefits of the future Post 2012- agreement, poverty reduction, community benefits, conservation of biodiversity and sustainable development are core principles to any successful climate mitigation and adaptation strategy. 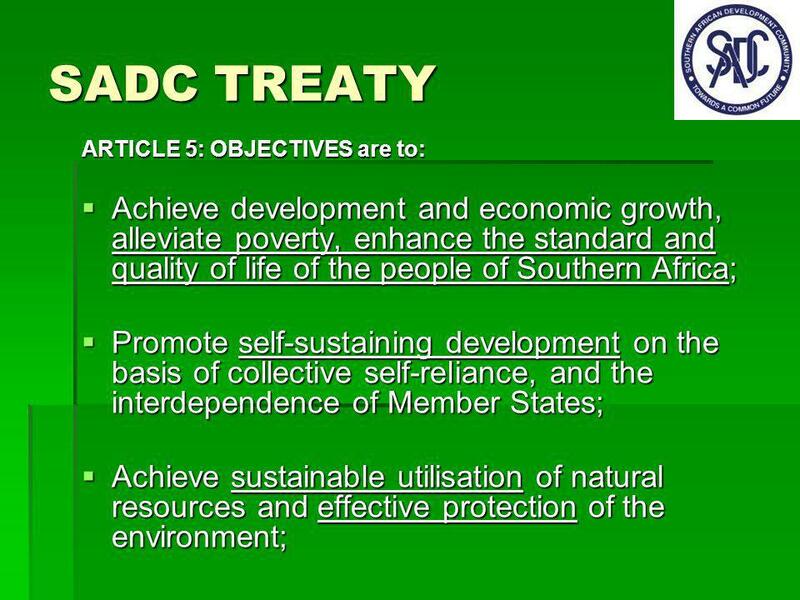 SADC argues that instead of being reduced to so called co-benefits of the future Post 2012- agreement, poverty reduction, community benefits, conservation of biodiversity and sustainable development are core principles to any successful climate mitigation and adaptation strategy. REDD mechanism should provide access to adequate, predictable and sustainable financial resources and technical support, including full access to global carbon markets. REDD mechanism should provide access to adequate, predictable and sustainable financial resources and technical support, including full access to global carbon markets. 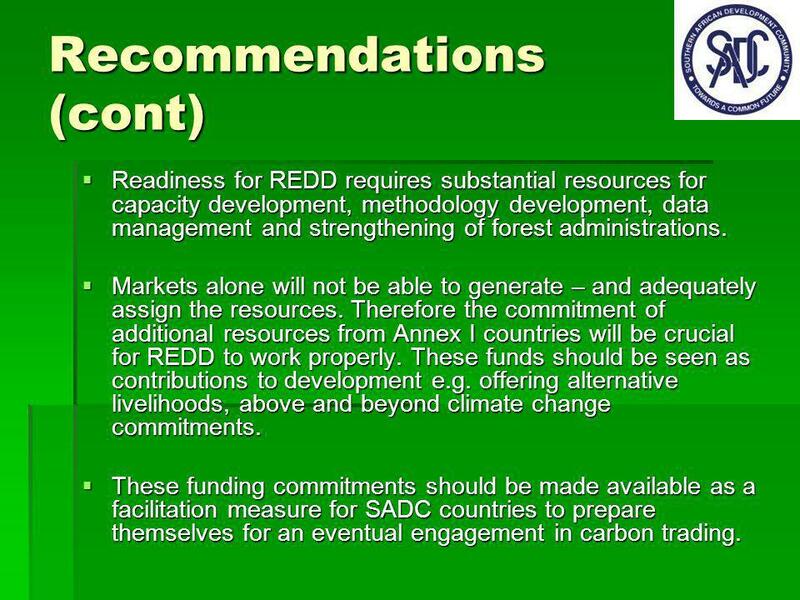 18 Recommendations (cont) Readiness for REDD requires substantial resources for capacity development, methodology development, data management and strengthening of forest administrations. Readiness for REDD requires substantial resources for capacity development, methodology development, data management and strengthening of forest administrations. Markets alone will not be able to generate – and adequately assign the resources. 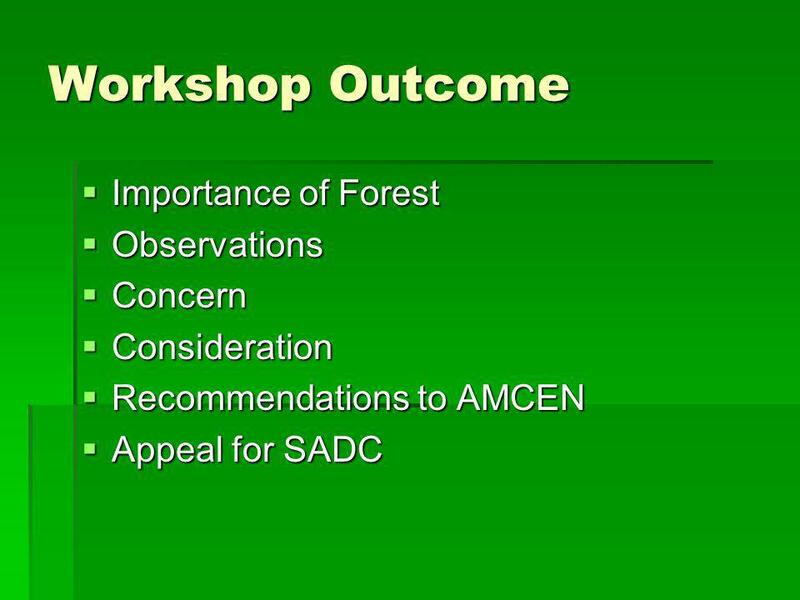 Therefore the commitment of additional resources from Annex I countries will be crucial for REDD to work properly. These funds should be seen as contributions to development e.g. offering alternative livelihoods, above and beyond climate change commitments. Markets alone will not be able to generate – and adequately assign the resources. 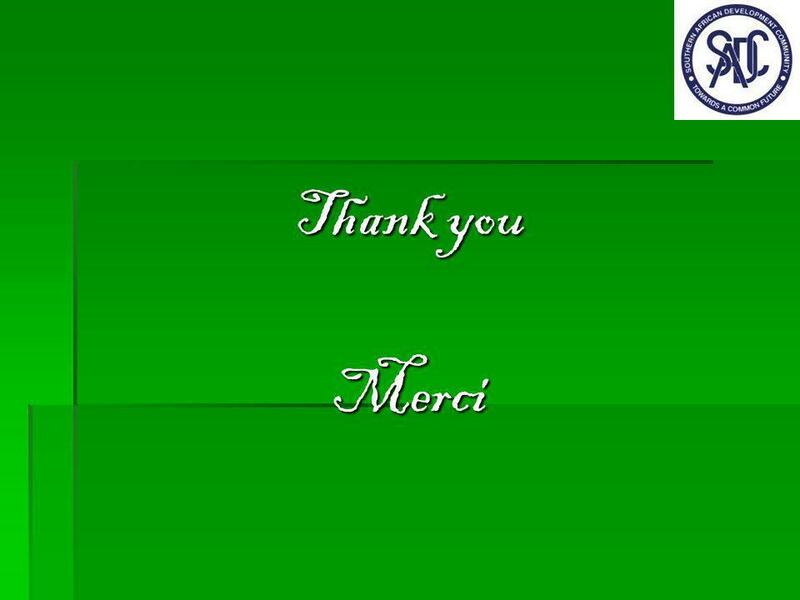 Therefore the commitment of additional resources from Annex I countries will be crucial for REDD to work properly. These funds should be seen as contributions to development e.g. offering alternative livelihoods, above and beyond climate change commitments. These funding commitments should be made available as a facilitation measure for SADC countries to prepare themselves for an eventual engagement in carbon trading. These funding commitments should be made available as a facilitation measure for SADC countries to prepare themselves for an eventual engagement in carbon trading. 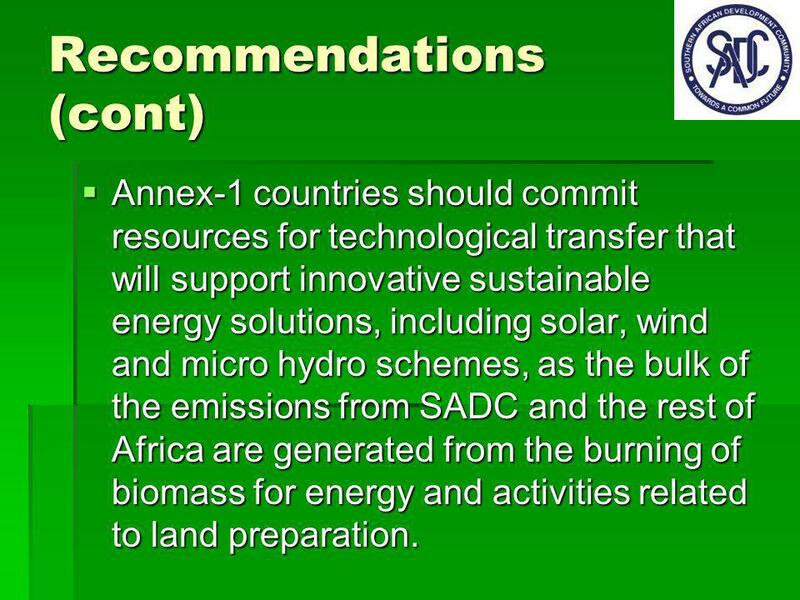 19 Recommendations (cont) Annex-1 countries should commit resources for technological transfer that will support innovative sustainable energy solutions, including solar, wind and micro hydro schemes, as the bulk of the emissions from SADC and the rest of Africa are generated from the burning of biomass for energy and activities related to land preparation. Annex-1 countries should commit resources for technological transfer that will support innovative sustainable energy solutions, including solar, wind and micro hydro schemes, as the bulk of the emissions from SADC and the rest of Africa are generated from the burning of biomass for energy and activities related to land preparation. 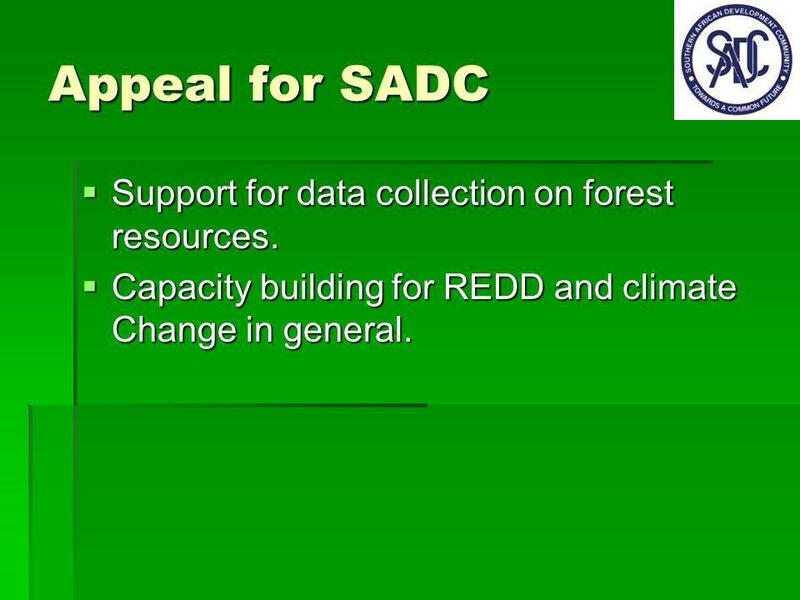 20 Appeal for SADC Support for data collection on forest resources. 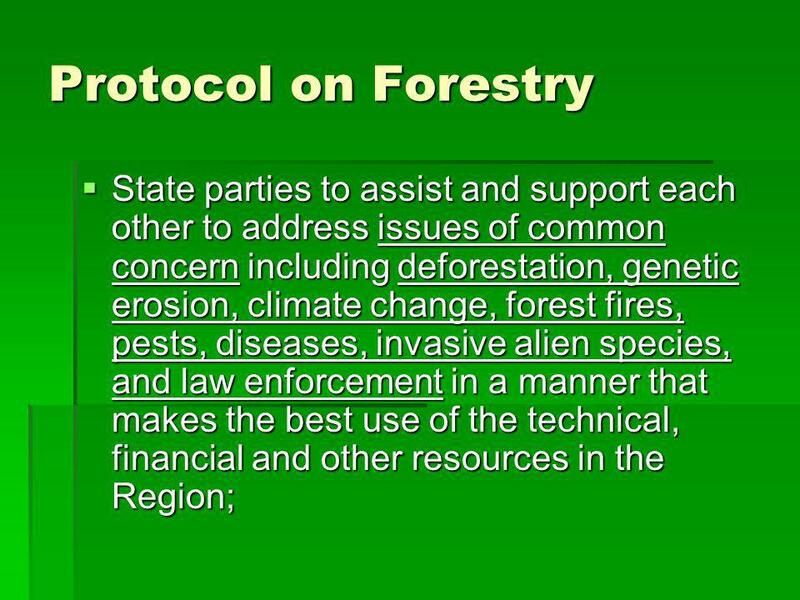 Support for data collection on forest resources. Capacity building for REDD and climate Change in general. Capacity building for REDD and climate Change in general. 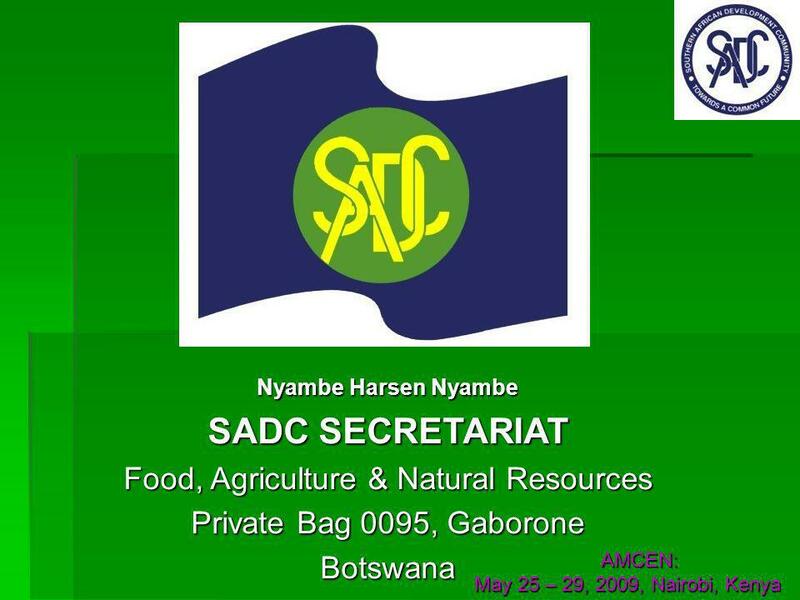 Download ppt "Nyambe Harsen Nyambe SADC SECRETARIAT Food, Agriculture & Natural Resources Private Bag 0095, Gaborone Botswana AMCEN: AMCEN: May 25 – 29, 2009, Nairobi,"
PRESENTATION ON SADC PROTOCOL ON FORESTRY Presentation deals with: Process Objectives Why Necessary for RSA Ratification. 1 The African Bio-Carbon Initiative Dr Charlotte Streck. GEF and the Conventions The Global Environment Facility: Is the financial mechanism for the Stockholm Convention on Persistent Organic Pollutants Is the. The call for a coordinated approach to Climate Change Africa-Wide Civil Society Climate Change Initiative for Policy Dialogues (ACCID) Lindiwe Majele Sibanda. The UNFCCC’s Bali Roadmap: building long-term cooperative action to address climate change Claudio Forner UNFCCC secretariat 8 consultants. UNFCCC Workshop on the Use of the Guidelines for the Preparation of National Communications from non- Annex I Parties Programmes Containing Measures to.